No coincidence this one is the California Special Package. The new Mustang has been a huge sales success for Ford, and not only in the US. It’s been the best-selling sports car among Germans (Germans!?). So when we got our hands on a 2016 Ford Mustang GT with the California Special Package for our latest video review, our excitement was evident. With its Race Red exterior and Ebony leather interior, the California package added, for an extra $1,995, hood vent-mounted turn signals, black racing stripes, 19-inch black-painted machined-aluminum wheels, a front splitter and California Special badges. Could we have found the ideal (and affordable) machine for a proper road trip along the Pacific Coast Highway? Probably. 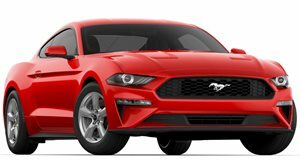 With its 5.0-liter V8 with 435 hp and 400 lb-ft of torque and six-speed manual, the Mustang GT still remains an overall performance bargain. And because Ford tossed us the keys for a week, we just had to try out the Electronic Line-Lock system, essentially providing perfect burnouts each time. Trust us, life’s good when you’re behind the wheel of a V8-powered Mustang. Whoever said the American muscle car is dead clearly hasn’t experienced this car.